I talk a lot about the birds, and as I wrote earlier about Spooky I decided the dog, Shadow, deserved some love. About a month after I moved into my first apartment, I called my mother at work for some reason. Because she can’t keep a secret to save her life, she blurted out that our 12 year old cocker spaniel, Max, hadn’t been well and she was taking him to the vet that night. Depending on the response from the vet, she might not bring him home. If you understand my meaning. 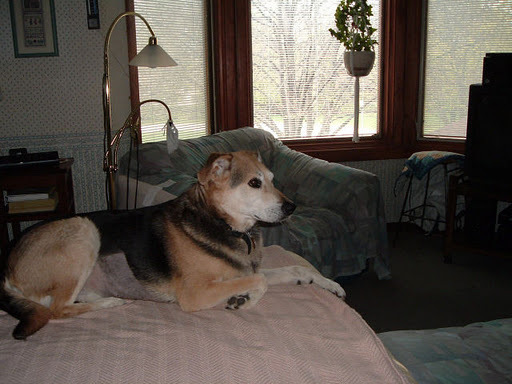 Max had heart trouble that we had been trying to manage for years, so I was not optimistic. I raced to the house after work and my dad was sitting in his chair in the family room looking awfully twitchy. As the minutes ticked by, we decided that whether Max came home or not, we were going to adopt a puppy the next day. 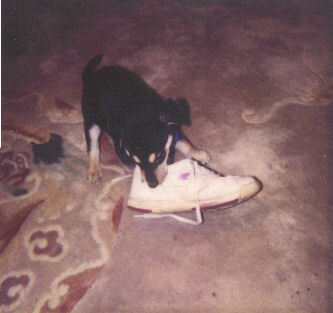 He sent me to the phone to call around the local shelters (this is before we discovered Petfinder ) and find him a mixed breed puppy. Max came home, but we had already decided. We found shadow the next day. Six months later, my parents split up and my mother got Shadow. Shadow is a great dog because he is totally unphased by the comings and goings of other animals in my house. And many are not too nice to him. Old Man Max was not interested in puppies. Not long after I moved back to the house, we got a new roommate and his dog, Natasha, whom he adored. Natasha left when the roommate left. As I mentioned earlier, Spooky the Cat also came with the roommate. Shadow tried to make friends with Spooky and took a claw to the eye. Emergency room. And Spooky is the one that stayed. When Natasha left, Dallas the German Shepard came. She was bigger, more energetic and sometimes pushed him around. I adored that dog, but sometimes you could just see Shadow rolling his eyes as she grabbed the scruff of his neck. We lost her to cancer. We have also babysat and fostered dogs – Shadow has been very patient with them, too. Kiwi the African Grey is the bane of his existence. She will not sit still and is always touching his people. Sometimes he yells at her using his Big Dog voice, but mostly he just herds her back to her cage. And now we have Manu, if only temporarily. Shadow likes Manu because Manu stays in his own space and drops plenty of treats down to him. Doesn’t even look like the same dog, does he? Shadow does not have his own web site and is not available for adoption.